Should the Three Peaks Challenge Charity Walks be Licenced? 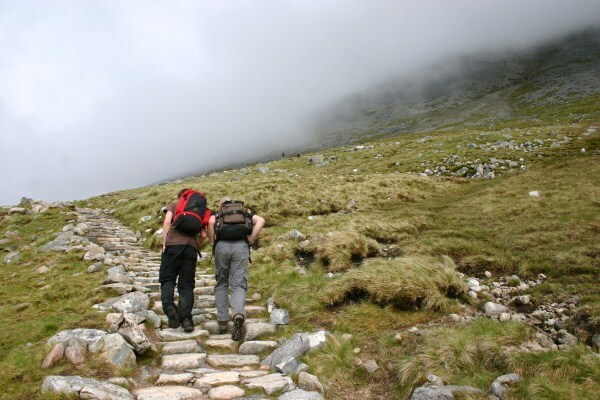 Ascending to the summits of Ben Nevis, Snowdon or Scafell Pike is a great personal challenge. Many people do so each year and come away with a sense of achievement which can last a lifetime – particularly as sometimes the last few hundred metres seem to have been conquered by will power alone. And the bigger challenge of completing all three peaks in 24 hours provides an even greater high. Because the mountains are so challenging people very often get sponsorship to climb to the top, and many of the walks are therefore done in order to raise money for a good cause. The knowledge that you are supporting charity probably adds an extra push when you need it to get to the summit as you won’t just be letting yourself down if you fail. The problem now is the sheer number of walks that are being undertaken for charity, and the resultant number of participants on the mountains. There seems to be no problem with walks that are properly organised, the walkers properly prepared and equipped, and where all those involved understand the premise that the mountain should be left exactly as they found it – with no rubbish left strewn around to spoil the enjoyment for others. But unfortunately this doesn’t happen in all cases. Scafell Pike is one mountain that suffers particularly under the strain of those on a Three Peaks Challenge – being the summit normally climbed during the hours of darkness, those taking part are often less cautious about what they are doing. A report last year stated the summit smelt of urine, and human faeces littered the path. Mountain Rescue Teams are there to help people who get into trouble on the mountains, often being called out to assist where a walker has fallen and injured themselves. This type of accident is a bona fide incident, and no one would begrudge giving assistance to a person with a broken leg. But all too often Mountain Rescue teams are being called out to attend incidents which were completely avoidable if the proper preparations were made! In a recent incident 2 walkers – part of a 90 strong group – got lost on the fells and had to be talked down to safety. The pair had no experience of walking in the mountains, and no map and no compass. Mountain Rescue teams are now suggesting that charity walks should be licenced on each of the three main peaks. Numbers per group should be limited, and criteria met to ensure the group will not need to call on the rescue services unless a real accident has occurred. Mountain Rescue teams are themselves funded by charity, and manned by volunteers, and it’s ironic that their charitable donations are being wasted to rescue others collecting for a different charity! MountainWalk has been contacted in the past by charity groups wanting to know if they need to register their walk with someone. At the moment the answer is they do not. Surely it would be useful though for them to need to register so that several large groups do not all decide to do the challenge at the same time? So that advice can be given as to how to properly prepare their participants so that they are properly equipped and therefore limit, as far as possible, the need to call on the services of Mountain Rescue teams? And given advice on how to limit the environmental impact on the mountains? Please leave your comments below on whether you think a licencing or other registration scheme would be useful for those planning walks in aid of charity on the UK’s highest mountains. This entry was posted in Mountain Walks by . Bookmark the permalink. Licensing may well provide one solution but also these charities need taking to task. Recently, my friend went on an organised challenge for the 3 peaks. However, the charity challenge organiser – and that is not always the charity themselves but often outside consultants – clearly hadn’t assessed the abilities of the group. Having to wait for stragglers on Ben Nevis – surely they should all be walking together at the same pace so as to avoid the above scenario wherein 2 got separated from the main group – meant that Scafell could not be completed. Sorry to have to say it but the 3 Peaks Challenge arena is a mess, bad for the environment and a drain on MRTs.